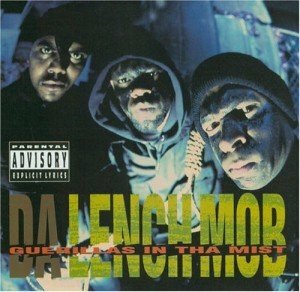 “Guerillas in tha Mist is the debut album by Da Lench Mob, who originally appeared on Ice Cube’s debut solo album, Amerikkka’s Most Wanted. The titular “Guerillas in tha Mist” was a hit at the release of the album, which also appears in the video game Grand Theft Auto: San Andreas, on the fictional radio station “Radio Los Santos”. The album was produced by Ice Cube and he is featured throughout the album though uncredited. The single “Freedom Got an A.K.” peaked at number 7 on the Hot rap singles charts. - The album comes in at #11 in Ego Trip’s Top 25 Rap Albums of 1992.